A carbon tax is a fee imposed on carbon pollution, usually increasing at a predictable rate over time. The tax is paid upstream by the producers of fossil fuels (i.e. at the mine, pipeline, or refinery). The goal of a carbon tax is to reduce greenhouse gas emissions using the power of price signals and free enterprise. Why is a carbon tax needed? Today’s energy market is broken. Due to subsidies, fossil fuels are artificially cheap, obstructing the market and preventing a level playing field. Industries pollute our skies for free, a massive hidden subsidy in addition to the breaks they received back in the day when the U.S. was trying to promote oil and gas development. Climate damages stemming from carbon dioxide emissions cost the U.S. billions each year and the American public is left to foot the bill. A carbon tax would internalize negative externalities by adding health and climate damages to the price of fossil fuels. This accountability would shatter the illusion that energy from fossil fuels is cheap. Given the correct price signals, consumers and producers would be incentivized to switch, quickly, to cleaner energy alternatives. It depends. Just like with any policy, a poorly designed carbon tax can be harmful to the economy. But a well-designed carbon tax will reduce our use of dirty fuels while spurring innovation and economic growth. If something is bad for society, it makes sense to tax it so we have less of it. In contrast to convoluted, big-government regulations, a well-designed carbon tax is a simple, effective, small-government way to address climate change. 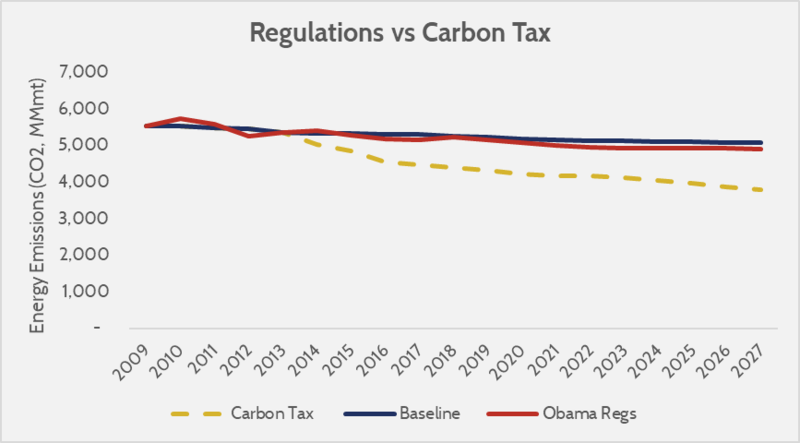 At republicEn, we favor a carbon tax that is both revenue neutral and border adjustable. What does “revenue neutral” mean? With a revenue-neutral carbon tax, the government does not keep the money raised from the tax, which means the government does not grow. Instead, 100% of the tax revenue goes back to the American people. This may be done by offsetting taxes elsewhere (e.g. cutting payroll or income tax) or by sending dividend payments to households. What does “border adjustable” mean? A border-adjustable carbon tax imposes a fee on imports from countries that don’t have a comparable price on carbon pollution. That way, American firms are not disadvantaged against countries without a carbon tax or tempted to outsource to these countries. This border adjustment helps keep the U.S. competitive in the global market, as well as entices our trading partners to enact their own carbon tax policy. How is a carbon tax fiscally conservative? At its core, a carbon tax is a market-driven solution. Solving climate change requires the innovation, speed, and creativity that only comes from free-enterprise capitalism, and a carbon tax accelerates this process. A carbon tax is transparent and predictable, allowing industry to pivot and plan for the future instead of getting bogged down by ineffective subsidies and regulations. It internalizes negative externalities, and also opens the door to repealing burdensome environmental regulations rendered unnecessary by the pollution fee. A carbon tax is the most conservative solution to climate change: simple, effective, and sensible. Would a carbon tax actually work? Yes. In a transparent, accountable energy market, consumers – not regulators, mandates, or fickle tax incentives – would drive demand for clean energy. Entrepreneurs would race to supply that demand, and we’d quickly shift to power our lives with the fuels of the future. Studies show that a carbon tax can reduce U.S. carbon emissions faster and more effectively than regulations. Would a carbon tax increase energy prices? Since a carbon tax would raise costs for fossil fuel producers, it would likely lead to higher energy prices for consumers (at least at first, until our economy transitions to clean energy sources). Researchers predict that a $25/ton carbon tax would cause the price of gasoline to go up about $0.21/gallon and the price of electricity to go up about $11/month for the average American household. This price increase is why it’s important for a carbon tax to be revenue neutral, returning the money to households. With money back in their pockets, Americans will be cushioned from the inevitable increase in energy prices. Who supports carbon tax policy? There is widespread agreement among economists that a carbon tax is the most cost-effective solution to address climate change. Many large energy companies, such as ExxonMobil and ConocoPhillips, have also endorsed a carbon tax. A growing number of U.S. politicians on both the sides of the aisle have pushed for carbon pricing legislation. Raise Wages, Cut Carbon Act (2009): Introduced in the House by Rep. Bob Inglis (R-SC) and co-sponsored by Rep. Jeff Flake (R-AZ) and Dan Lipinski (D-IL). Calls for a revenue-neutral carbon tax in exchange for equivalent cuts in payroll taxes. MARKET Choice Act (2018): Introduced in the House by Rep. Carlos Curbelo (R-FL) and co-sponsored by Reps. Brian Fitzpatrick (R-PA) and Francis Rooney (R-FL). Calls for a carbon tax paired with a repeal of the gasoline tax. Revenue designated mainly for infrastructure projects. Energy Innovation and Carbon Dividend Act (2019): Introduced in the House by Reps. Francis Rooney (R-FL), Ted Deutch (D-FL), and five more Democratic members. Calls for a revenue-neutral carbon tax with all revenue returned to Americans in the form of dividends. Climate Leadership Council Carbon Dividends Plan: Proposed by a coalition of respected conservatives including James Baker and George Schultz. Calls for a revenue-neutral carbon tax with all revenue returned to Americans in the form of dividends. Green Flat Tax: Proposed by economists Art Laffer and Stephen Moore. Calls for a carbon tax in exchange for a flat income tax of 18%. Want to address climate with bold innovation? We need the EcoRight to help us pull this off.